It might have opened its doors to the public just a few years ago, but Zambia’s Tongabezi Lodge offers both excellent service and the ideal ambiance for communion with nature. The lodge is located on the Zambezi Riverbanks near Victoria Falls and was officially opened in 1990 by the late Will Ruck-Keene and Ben Parker. 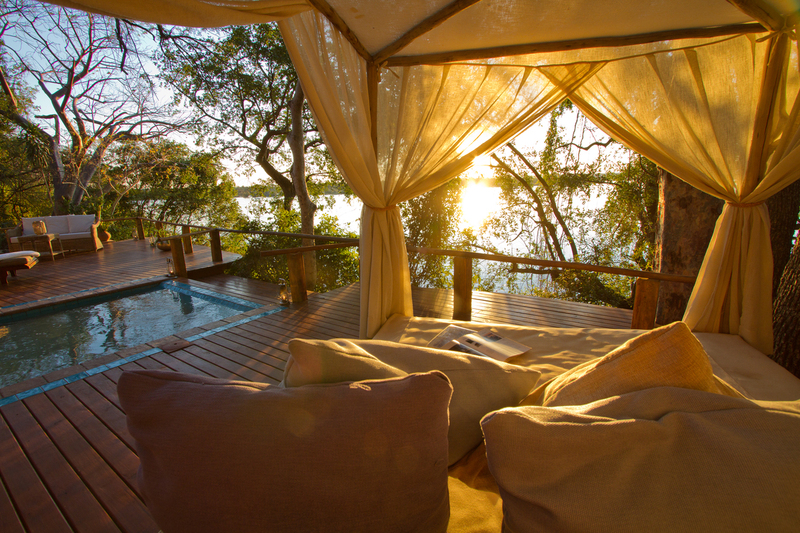 Since its humble beginnings, Tongabezi has transformed into one of the prime lodge destinations in Zambia. Tongabezi has continued to expand over the years to include luxury lodges that cater to guests’ unique needs. The tranquil Zambezi river is the setting for Tongabezi’s cottages and camps. Waking up in the morning to the gentle lapping of water against the banks, or enjoying a dusky sunset while hippo gracefully tread the placid waters are some of the memorable experiences to be had at Tongabezi. Lush foliage set high on the banks house chittering African weavers hell-bent on constructing their intricate nests above the water. Spot a visiting Marabou stork wading inquisitively through the mud seeking a tasty morsel, or observe the majestic African elephant revelling in the cool water after a long day of safari in the bush. Keep a look out for the African fish-eagle, an impressive raptor that scours the river for unsuspecting prey. All of Tongabezi’s lodges are incredibly stylish. The philosophy of Tongabezi’s decor and design seem to be a tribute to raw materials such as wooden rafters, decks and thatching that add to the relaxed yet refined feel of this space. Exposed stone cladding, glass and crystal clear lap pools look out on the Zambezi while light cotton drapes flutter gently in the breeze. This is the perfect spot to relax on a daybed with a good book and a chilled glass of wine or gaze at the stars from your private balcony with your loved ones. 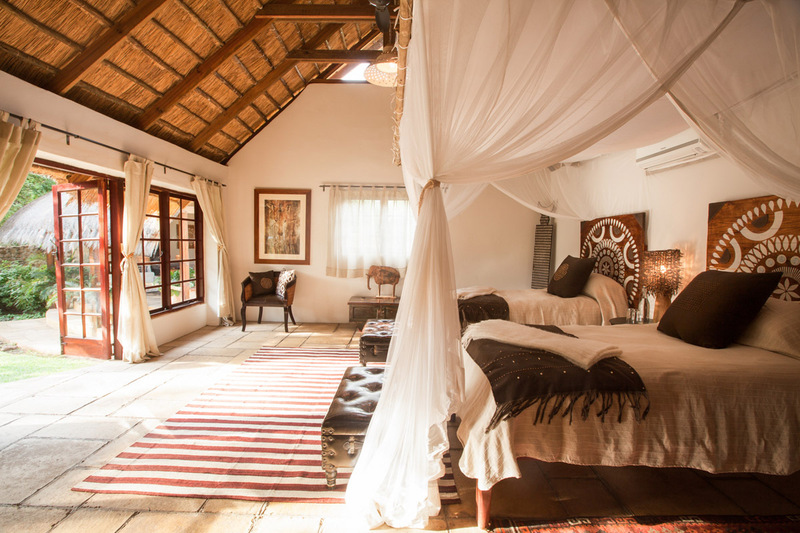 Tongabezi makes use of mixed styles, from bohemian mosaics to earthy rattan light pendants, each one of Tongabezi’s lodgings are comfortable and on trend. Arguably the best thing about the Tongabezi is you don’t have to wait until a particular time of the year to enjoy certain privileges. As long as you are a guest at the hotel, you will have the opportunity to explore the bush on walking safaris, experience the Zambezi on boating trips and get up-close and personal with wildlife on guided game drives. Take a tour to the traditional Zambian village of Simonga to learn ancient Zambian traditions as well as capturing the beauty of the people and culture of Zambia. Artisanal crafts and souvenirs at Mukuni Park are available for a spot of shopping. Learn more about Zambia and Victoria Falls at the Livingstone Museum. In addition, sample a couple of elephant rides, test your metal on a white water rafting expedition or conquer your fear of heights in a personal helicopter ride. Tongabezi defies preconceived ideas about what an African safari should be. Since its conception, Tongabezi has exceeded guest expectations by combining rustic bushveld feels with refined luxury and class. 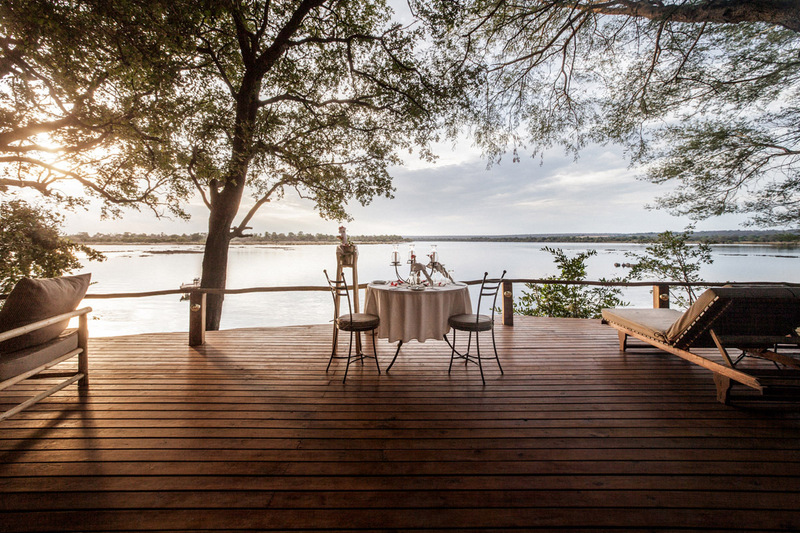 Panoramic views of the Zambezi, private terraces and open-air, sunken baths give new meaning to luxury and a trip here should be on your bucket list. Fine dining and fresh hospitality define Tongabezi’s philosophy of authenticity, experience and glamour. Whether you’re a couple on honeymoon, a large family out seeking adventure or even a lone traveler looking for the finer things in life, Tongabezi is not to be overlooked. Contact us for a bespoke Zambia safari itinerary.